First of all, I should let you know that I debated calling the title of this post something different. In fact, the title of this post makes me cringe a little. The Food Babe lifestyle has never been about the number on the scale, nor do I ever want it to be. I also don’t want to encourage any feelings of self-doubt about body image for new Moms. Feeling good after having children should not come at the price of obsessing about weight, or trying to get your “pre-baby body back” because if you are a mom – you know your body (and mind and spirit) has been changed forever. Becoming a mom has been the greatest thing I have ever achieved in my life – nothing will ever come close and no extra weight on my body will ever take away the joy I have from giving birth and getting to spend time with my little girl. But there is a reality of wanting to look and feel like your best self again and this post is all about that. When I became pregnant I didn’t know what exactly would happen to my body. I spent so much time over the years cultivating habits that made me feel healthy, energetic and vibrant… and then all of the sudden I was nauseous, had the burps, and was tired all the time. Although I had a great pregnancy – I felt pretty good and didn’t really have much to complain about – let me tell you, I was no longer feeling my best! For example, I suddenly found myself hating to cook because everything smelled funny (only in my first trimester – thank goodness) and hating to travel (my favorite hobby!) Sitting in an airplane seat was the most uncomfortable position ever! I realized that the symptoms I was experiencing were just caused by everything the body goes through while creating a little human. You know, you’re making a baby after all… and so of course you’re not going to feel like your normal self. This was a bit of an adjustment for me, but of course was all worth it. Fortunately, I was able to workout all the way up until I gave birth which I know helped keep my mood stable, digestive system happy, my circulatory system working great and kept any swelling down. I did a mixture of weight-lifting, walking and light cardio throughout my pregnancy. I was around 155 pounds when I gave birth, gaining about 35 pounds during my pregnancy – I also developed varicose veins and had new cellulite on my legs. After I gave birth, I was head over heels obsessed with my baby (and still are!). That obsession took priority and helped me not worry too much about how I looked after giving birth – although to be honest, it was always in the back of my mind, I wanted to get back into my old clothes. I always envisioned myself as an active and fit mom – someone that will be able to keep up with my kids, climb mountains and run around. 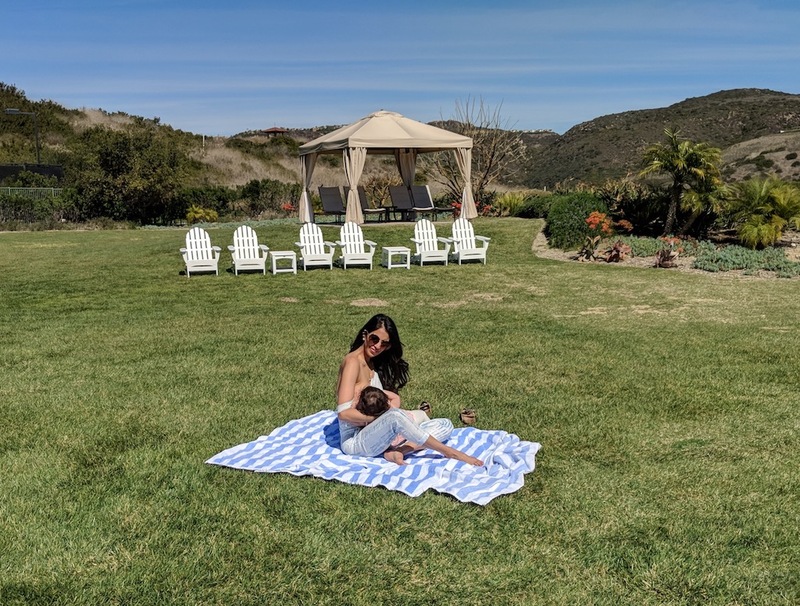 Instead of going on a fad diet, I kept my focus on making sure I was getting appropriate nutrition so that my breastmilk would be as nutrient dense as possible without harmful chemicals. Making sure my breast milk was clean of processed chemicals and other toxins kept me from eating badly. The health of my baby comes first, so it was great motivation. I did this by eating an organic and unprocessed diet, avoiding packaging as much as possible – and as a result, the extra pounds I gained during my pregnancy came off without having to do anything special (the varicose veins and cellulite vanished too). By 5 months postpartum, I was already back into my pre-pregnancy clothes which I was very happy about but at the same time, my hair started falling out. This was FREAKY. Every time I took a shower and washed my hair, it was like a murder scene! I had to wear my hair up for weeks so my daughter wouldn’t be covered in it while she breastfed. I had a lot of postpartum hair loss on the top front of my head, but thankfully after two months, it stopped falling out and started to grow back. All that lush pregnancy hair was gone but thankfully my hair is almost back to normal and it was only temporary (and completely normal according to my doctor). And now a year later, I’m down another 10 pounds, but that wasn’t my goal. My goal wasn’t to be thin, it was to feel good. Feeling good as a mom means I have good energy, a good mood and can do all the million things I need to do without getting stressed out. Eating clean, unprocessed food makes me feel so good! If you would have asked me over 10 years ago, “Can I lose 40 pounds after pregnancy?”, I’d tell you that I thought it would be MUCH more difficult and maybe not possible. I’d be counting every calorie and caught up in the old mentality that I had about food. Focusing on the quality of my food helped my weight struggles vanish for good and stopped that yo-yo state of dieting I always used to find myself in. Above are candid selfies of 40.5 weeks pregnant and 1 year later in the same nursing bra. I also debated not sharing these, considering the comments I might receive, but nothing can be worse than what I have already experienced online sharing my life. I am proud of my healthy body post-pregnancy that continues to nourish my baby through breastfeeding and no one can take that away from me. If you are wondering how and what I ate, I’ve put together a free E-Book for you. I hope this helps all you new Moms out there feel the best you can feel! The key to losing the baby weight fast is staying consistent day in and day out. This takes only minimal planning ahead of time but will absolutely allow you to reach your goals in record time. Pick a day that works best for you during the week and simply choose 3-4 recipes to make at home. This could be 1 breakfast, 1-2 lunches and 1-2 dinner recipes. Before the baby came, I spent the last few weeks of my pregnancy tripling recipes so I could freeze them. My freezer stash of soups, stews, burritos and such lasted a good month postpartum. Start slowly, but try to work up to high-intensity exercise a few times a week. For the first few weeks after giving birth I just took daily walks outside with Harley. Then I slowly started doing a little bit of elliptical training. About 4 weeks in, I began lifting some weights, and started going back to Hilliard Studio Method classes. Eventually I also took on Orange Theory – which is a lot of running and interval training. I wasn’t able to go every day – but just as much as I could when I had someone to help watch Harley. To make your prep and cleanup time as quick as possible, use a small slow cooker. For breakfast, I would throw all the ingredients in a slow cooker the night before and wake up to a delicious and nutritious meal. Once you clean out the slow cooker from the morning, feel free to do the same with soup for dinner. Add some chopped vegetables, spices, protein and stock to the pot and set on low for 8 hours. Get over 50 of my favorite slow cooker recipes here. One of the easiest ways to sabotage your success is lack of planning. Snacks are one of those areas where if you’re not careful you can easily overeat or eat foods that will promote weight gain. Take 5 minutes at the beginning of the week to ensure you have stocked your pantry or refrigerator with healthy snacks such as chopped vegetables, nuts or nut butter, brown rice crackers, etc. Soup is so easy to make and with the right recipes it can be done in a pinch. I would often alternate between making different nourishing soups for dinner or salmon with a side of sweet potatoes and green vegetables. When eating salmon, try to limit your intake to twice per week. If you know anyone who’s struggling to lose the baby weight or is currently pregnant and worrying about it, please share this post with them. I want all mothers out there to know that this is nothing to focus on other than getting the best nutrient dense food into your body! 15 Clean Eating Lunches You Can Prep In 15 Minutes Or Less!